Offer for single user ( Means One PC ) for every additional User (Means additional PC) licensing key/Re-activation 30 % on current licensing fee shall be charged extra. For full Licensing key (Serial number) validity : Key is valid for life time as long as the system is not changed or formatted. If after one year from date of licensing the system changes key activation shall be charged. Plume, Puff, Spill Dispersions with tabular and graphic display with 5-User defined Isopleths in XY-Slice and Isoelevets in XZ-Plane at Y-Cross wind distance. Full 3-D “CAT-Scan” output possible with dispersion “Cake slicing in XY (Isopleth) and XZ (Isoelevet) Graphs. Graphics are in colour as Custom colour, Default colour or BW. It is a complete CAT-Scan with Probits (PROBIT short for Probability Unit, is the percent Fatality and Injury due to exposure to any hazardous agent.). This Advanced Dispersion provides for Mass and volumes of various concentration zones and concentration zone shells of Plumes, Puffs and Spill pool evaporation dispersions. Options for Conc. Conversion, computing: mol. Wt., IDLH-TWA & LEL-UEL of mixtures, LEL-UEL at any temperature, LC-50 of man from animal data, LC/RIC of mixtures, Weighted average, Temperature conversion and calculator. Pool fire, jet fire, Flash fire, Fireball Coal heap fire with PROBITs. Graphics, protective shield for protection of Jet Fire impact on Equipments, Hot Body radiation, Combustion Gases of any Combustible material. All Graphic Displays are in colour as Custom colour or Default colour or BW. Options for Density conversion and calculator. UCVE, Under Ground Explosions, Mechanical Explosions-Cylindrical Vessel, Spherical vessel, Pipe line ruptures, Inerting of flammable vapours, Vacuum purging, Pressure purging, Sweep purging, Static charge in Pipelines, Static charge on Persons, Dust explosion, Fire Balls with PROBITs, Ignition/No-Ignition and Explosion Chances onsite, offsite, TNT-Equivalent and Heat of Combustion of Dusts, Energy per Mass in different units, Explosion mass of Plumes, Puffs and Spill Pool Evaporations, All Graphic Displays are in colour as Custom colour or Default colour or BW. Options for TNT-Equivalent, Weight conversion and Calculator. pipelines, static charge on persons, Dust explosion, Fire Balls with PROBITs. Graphics are in colour as Custom colour or Default colour or BW. Options for TNT-Equivalent, Weight conversion and Calculator. 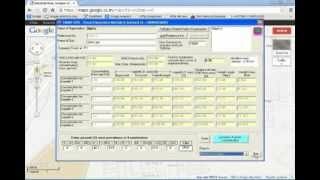 This Module covers both DOW and MOND Indexing Software. These constitute a system of indexing the Fire & Explosion and Toxicity levels so as to categorize plant sections in to different Levels of Hazard Zones involving Fire & Explosion and Toxicity hazards. These software make use of Operational, Storage Quantities and Parameters like Temperature, Pressure etc. and the Hazardous Properties on Fire/Explosion and Toxicity of the individual Chemicals handled and provides for Penalties for each Parameter of Operation/Storage and Handling of the Chemicals. The Penalties are grouped in to General Process Hazards (GPH), Special Process Hazards (SPH) etc. These Penalties are then Reduced to a Standard Index for comparing the relative levels of Hazards of different sections of Plants. The DOW and MOND Fire and Explosion and Toxicity Index computations provide a very useful step in Hazard Identification Technique. HAMSAGARS software also provide for a Comparison of Both Indices. International Standard Scale Safety Performance Rating (ISSPR) based on the model developed by the Chemical Industries' Association UK. Six-Sigma Accident Prevention. on the model developed by the Chemical Industries' Association UK. Environmental Impact Assessment (Gaussian dispersion air modeling) fully conforming to “Assessment of Impact of Air Environment: Guidelines for Conducting Air Quality Modeling”, Programme Objective Series: PROBES/70/1997-98. The Program has 2-[Options: 1. Hourly EIA and 2. Long Time EIA. The Hourly EIA covers Stack Dispersions under Stability Class for data used and includes 11-Stack Gases covered under Ambient air Quality Monitoring Standards Published in Gazette No-660 dated 16th November, 2009 namely: SO2, CO2, NO2, CO, CH4, SPM<10 mcr, SPM<2.5 mcr, Pb, O3 with Standards under Industrial, Domestic and Sensitive locations. And Indian and World Capital city data ready for use. The Long Time EIA option is for 8, 16,24 Hourly and Annual EIA. Options for Temperature conversion and Calculator. 8. High Way Pollution. Enables computation of High way Pollution based on Number of 2-Wheelers, 3-Wheelers, 4-Wheelers, 6-Wheelers passing through at a given stretch of a High Way. Advance Air, stack gas dispersion (EIA) (Gaussian dispersion air modeling), fully conforming to “Assessment of Impact of Air Environment: Guidelines for Conducting Air Quality Modeling”, Programme Objective Series: PROBES/70/1997-98, The Program -[Options: any Time EIA. covers Stack Dispersions under Stability Class for data used and includes Stack Gases covered under Ambient air Quality Monitoring Standards Published in Gazette No-660 dated 16th November, 2009 namely: SO2, CO2, NO2, CO, CH4, SPM<10 mcr, SPM<2.5 mcr, Pb, O3 with Standards under Industrial, Domestic and Sensitive locations. Source Module: Is Based on computational fluid dynamics CFD -Liquid flow through a hole in a tank, Liquid flow through a hole under constant pressure, Liquid flow through a pipe, Vapour/gas flow through hole, Vapour/gas flow through a pipe, Flashing liquids stored above atmospheric B.Pt., pool evaporation by substrate heat conduction and wind, Tank dimensions, Dyke dimensions, LPG-bund computations. Options for converting Density, mass, force, latent heat, specific heat, pressure, temperature, computing vapour density, vol. Of vapour from P1T1 to P2 T, and Calculator. FAR, FN-Curve, ISO-Risk, Individual Risk computations. Graphics are in colour as Custom colour or Default colour or BW. Evaluates the existing EMP (Emergency Management Plan) in a quantified way showing the deficiencies of the EMP and improvements required. A computer-generated report is also provided. 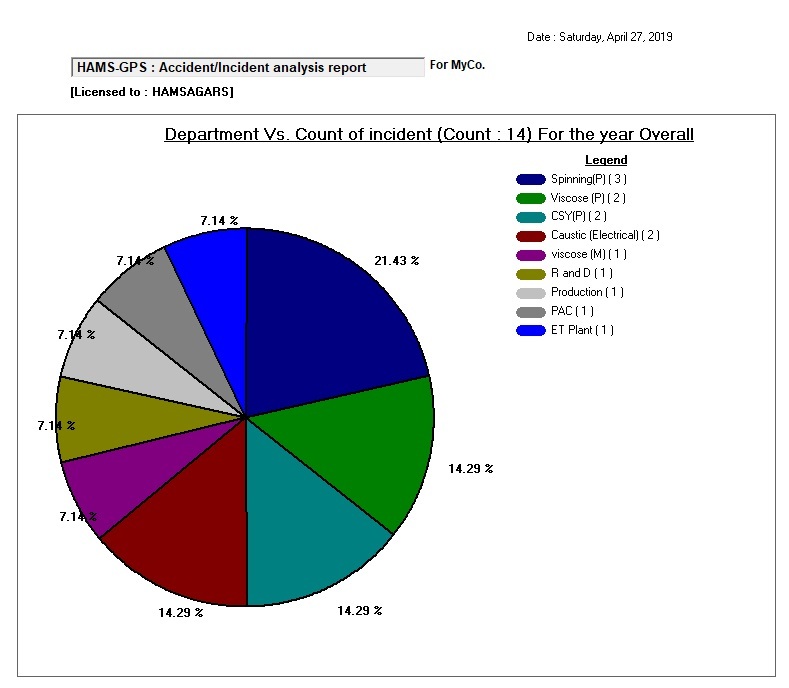 For analysis of fire incidents to show the pattern of accidents through charts and tables. Total of 34-Reports. Limits Module gives the maximum concentrations at height of simulation for Plume, Puff and Spill dispersions for all the stability classes A, AB, B,BC,C,CD,D,DE,E,EF and F, and the distances for any Isopleth concentration specified by the user in tabular and graphic form again for all the stability classes. The Limits out puts of Max. Concentrations in ppm and the distances for user defined is ppm concentration for all the stability classes, is very useful in Emergency Planning, Preparedness, Mock Drills and Training. Provide Percent Fatality/Injury and Absolute Fatality/Injury sector wise for Plume, Puff, Spill dispersions, Explosions and Fire-Ball scenarios. Evaluates the existing Occupational Health and safety Management System (OHSMS) against the globally acceptable OHSAS-18001 standard. This module enables evaluation of the House Keeping system against the Japanese 5-Star House Keeping Evaluation system. This module enables development of maximum Credible Loss Scenarios (MCLS) also called Maximum credible Accident Scenarios (MCAS) for QRA Study conforming to International guidelines under World bank Technical Ppers-55. This module provides for over 200 Chemicals and select parameters for Scenario development with options for user defined chemicals and parameter selections. A Unit Conversion Software with 55-units conversion from one type to the other plus vapour density computation, Concentration conversion, LEL-UEL of Mixtures of flammable vapours, TNT-Equivalent, Degree- Radians conversion, Temperature conversion, LEL-UEL vs. Temperature, Reinhold Number, Temperature conversion, Safe Oxygen Level. HAZOP Software with Risk Based Investigation (RBI)-Matrix conforming to European Safety Center’s Process Safety Review system and several Preset Design Intentions of most commonly used operations constituting the most advanced HAZOP Software. In addition HAZOP output gives Safety Integrity Level (SIL) of Safety Instrumentation System (SIS) and Levels Of Protection (LOP) of equipments. The BLEVE module is very advanced HAMS-GPS Software that provides for BLEVE, Fire Ball and Flash Fire with Frequency computation Event Tree, Graphics in colour, The BLEVE Module has library of 15-Flammable chemicals including some Compressed Liquefied gases like LPG, Propane etc. The Module has built in options for BLEVE at storage pressure (for Compressed Liquefied Gases) and at user defined temperatures. Options for Cylindrical and spherical vessels are there. It has also a built in library of 6-MOC of storage vessels. Atmospheric Stability Class Percent Prevalence with 28-city meteorological database, Single stability class and computation of ASCLAP percent distribution month wise over the year. The Well Blow out module is one of the most complex and advanced software the computes the Oil/Gas well blowout scenarios and consequent fires, explosions and their effects. For oil well blow outs onshore and offshore situations, the module computes the oil spread on shore and oil sleek spread on sea taking the wave and wind parameters. Safety Manual Review is based on comparison of the existing Safety manual with an ideal one. It generates a quantitative evaluation and a MIS report for improvements. The QRA Review enables review of a QRA Study in comparison with world class QRA study and gives quantified evaluation report and MIS report for improvements. It is very useful to decide on the shortcomings of any QRA study. Evaluates the existing Environment Management System (EMS) against the globally acceptable ISO-14001 standard. Enables computation of Fire Water and Foam requirements as per OISD-116 and 117 and also as per TAC Rules and Factories’ Act and Rules. The areas covered include: Floating Roof Tank area, Fixed Roof Tank area, LPG-Sphere area, LPG-Bullet area, LPG-Rail gantry, LPG-Road Tanker gantry, other Flammable Rail gantry and Road Tanker gantry, Auto Foam flooding requirements for Floating Roof tanks. ALARP is short for “At Least as Low as Reasonably Practical” and is designed by Health and Safety Executive of UK. To rank the FAR level. HAMS-GPS ALARP software enables developing ALARP Diagramme in color Graphics and tabular form in a FAR Scale from 0-99 and shows the hazard levels of Total FAR and four top level Scenario FARs. This is a Safety Performance Measurement (SPM) software conforming to European Process Safety Center’s SPM System and is valuable in advanced Safety Audits and Process Safety Reviews. Advanced Dust Dispersion Module enables determination of dispersion and settling of dust of various particle sizes in Microns released instantly as Puff as in blasting in mining operations as well as continuous release of Plume from stack dust in the gases. The Module gives in Tabular and Graphic form the results of dispersion and settling during day and night under stability classes B for day and E for night conditions. 39. Noise Pollution Provides for determining Road Traffic Noise Pollution Hourly and annual and Noise addition (Note Noise addition from 2 or more Sources is complex and cannot add directly). Also provides Noise Theory. Advanced Consequence analysis / QRA Study software. – Mapping available in advanced software only. ii. Explosion pressures in PSI can be plotted to scale on Site Maps both in Graphics and AutoCAD .dwg files. Graphs can be plotted to scale on Site Maps both in Graphics and AutoCAD .dwg files.